Some previous theories have attributed this darkening to water on top of the ice sheet - often seen as strikingly sapphire blue ponds, rivers and lakes. But a new study in Nature Communications provides a new hypothesis based on the character of the impurities on the ice surface itself. "What we show is that the Dark Zone is covered in a finely distributed layer of dust, and black carbon, which provide nutrition for dark coloured algae. These are the main cause of the darkening," says professor Alun Hubbard, the co-author of the study and professor at CAGE (the Centre for Arctic Gas Hydrate, Environment and Climate at UiT, The Arctic University of Norway). The Dark Zone is literally a dirty belt of the melting area - the ablation zone - of the ice sheet. The darker this ablation zone is, the more of the sun's energy it absorbs, and the faster the ice melts. Albedo is a measure of the reflectance of the ice sheet. It is the major factor governing how much incoming solar radiation is used to melt the ice and is the main positive feedback in Arctic climate change. Bright white surfaces, like snow or pure ice, reflect the sun's energy, but dark surfaces absorb it. "The fact that a large portion of the western flank of the Greenland ice sheet has become dark means that the melt is up to five times as much as if it was a brilliant snow surface. " says Hubbard. The ice algae seem to be one of the major players in this scheme - even the slight increase of the atmospheric temperature and liquid water production seems to promote algae colonization across the ice surface. "The algae need nutrients and food, essentially dust, organic carbon, and water. In summer, these are plentiful and the algal bloom takes off. Because algae are dark in colour - they reinforce the dark zone. Thereby you get a positive feedback effect where the ice sheet absorbs even more solar radiation producing yet more melt." 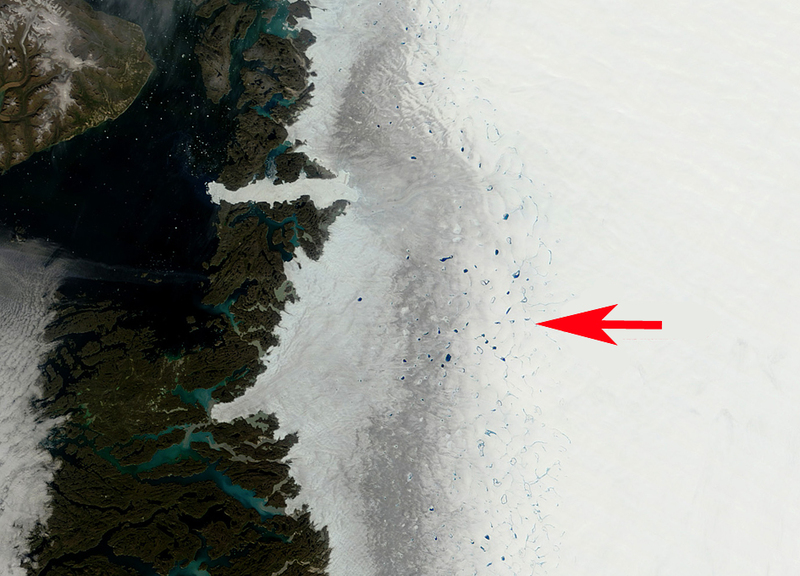 The Dark Zone of the Greenland ice sheet is vast and previously observed by satellites such as MODIS. But for this study the scientists employed relatively modest drones - or unmanned aerial vehicles (UAV) - to survey the darkened ice belt in unprecedented detail. While satellite data are great for the big picture of what's happening across the entire Greenland ice sheet, they only work at really coarse pixel resolutions. "If we compare it to camera pixels, even the best satellites for the ice sheet imaging have resolution of tens of metres. They can't see the detail of what's happening on the ground. Our fixed-wing UAVs can take hundreds of images with pixel resolutions on the centimeter scale with an operating range of hundreds of kilometres," says Hubbard. Scientists could see in real detail what the dark zone is made up of. In effect, this UAV survey across the ablation zone of the ice sheet perfectly bridges the gap between people on the ground studying what's under their feet in just one part of the ice sheet, and the satellite data that shows what's going on across the entire ice sheet. "The UAV survey, with its amazing detail, allows us to identify and characterize all the different surface types and impurities across the entire dark zone, not just a small local little part of it." The AUV images used in this study were collected by Johnny Ryan (Aberystwyth University, Brown University, University of California), Jason Box (GEUS) and Alun Hubbard (Aberystwyth University/CAGE) in the summer of 2014. Thanks - I read your site every day, always checking for news and updates.